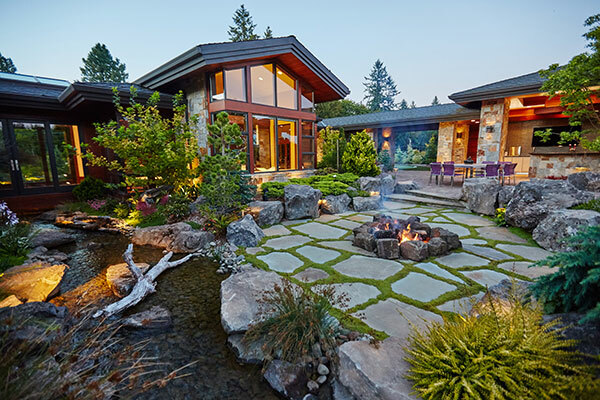 This project was intended to connect the residence’s exterior with the interior, and to foster as much outdoor activity as possible. The flat site was surrounded by a commercial business operation, so there was a need for privacy and add water elements. 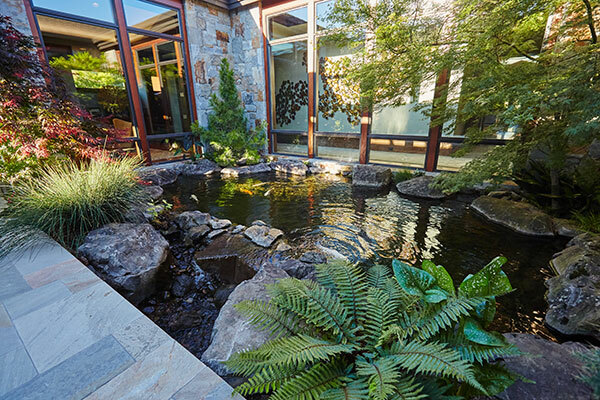 Separation was needed between the saltwater pool and fresh water stream because koi reside in the stream and pond below. To maintain the illusion that all water was connected and the pond water continued down the stream, the contractor created a separation wall under the bridge. Special attention was given to the water levels so everything appeared connected. A stream passes under a glass floor inside the house and continues to a pond beyond. Plants and irrigation were carefully coordinated with the house bridge installation. Each glass panel is 2 in. thick and weighed about 500 lbs. 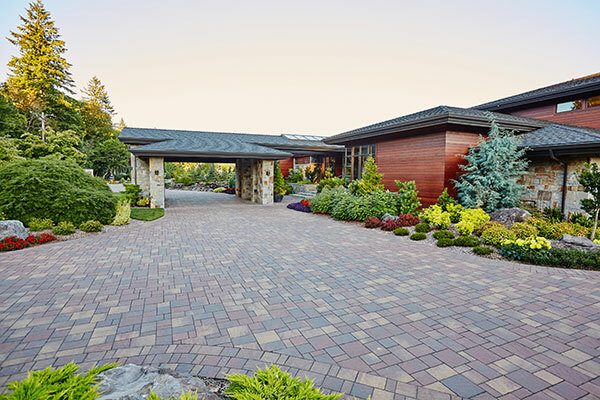 The project earned Dennis’ 7 Dees Landscaping & Garden Centers a 2016 Grand Award from the National Association of Landscape Professionals’ Awards of Excellence program. The sunken fire pit patio surface features drip irrigation tubing between each variegated blue stone joint to ensure consistent groundcover growth. This “before” photo was taken during construction of the saltwater pool, lagoon entry and pool bridge that kept these waters separate. 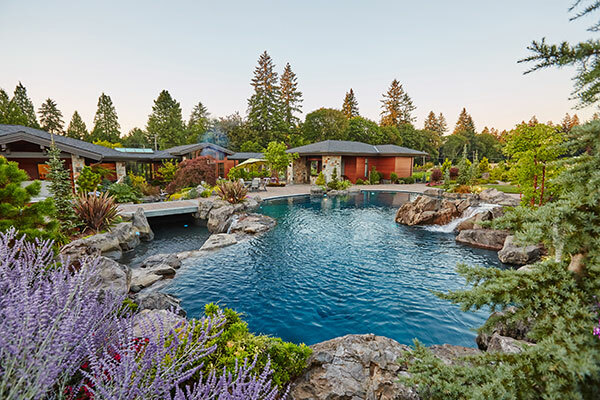 More than 350 tons of mossy boulders were incorporated into the 50,000 gallon saltwater pool and surrounding areas, all inspired by a favorite lake of the owner. An outdoor stereo system contains numerous concealed speakers in the landscape and a sub-woofer buried in the ground for an outdoor concert environment. 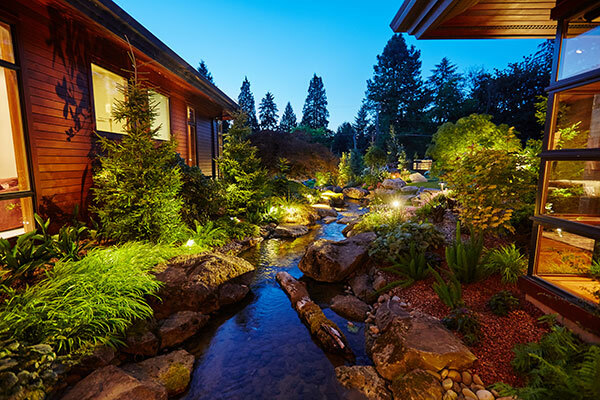 This stream flows from underneath the glass bridge and between the two wings of the house into a large front-yard koi pond. 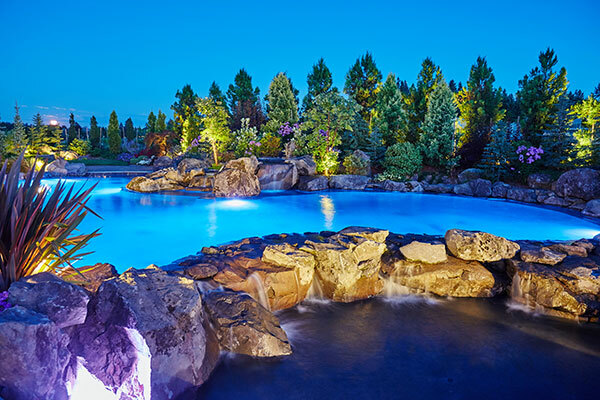 All lights, including the color-changing LED pool lights, and the outdoor stereo system are controlled from an iPad or iPhone. 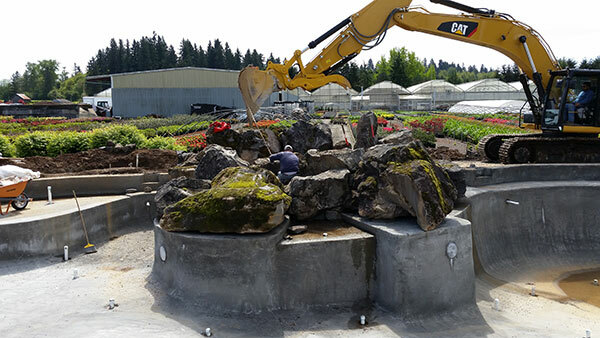 Setting the massive 4- to 8-ton boulders for the pool waterfall with an 80,000-lb. track hoe. This was needed to reach out more than 30 ft. to set some of the largest boulders. The pool boasts both upper and lower waterfalls that spill into a lagoon entry. 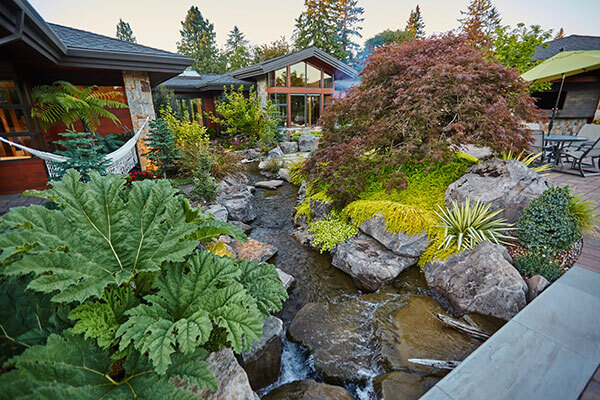 The stream, which originates more than 200 ft. away at the pool, also extends underneath a cantilever of the house. 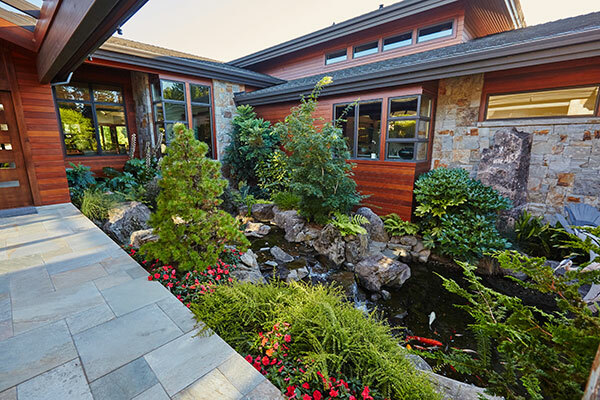 Instead of bark mulch, more than 100 cubic yards of local hazelnut shells were used as a planting bed top dress throughout the entire property, to prevent erosion and runoff into the pool, ponds and streambeds. 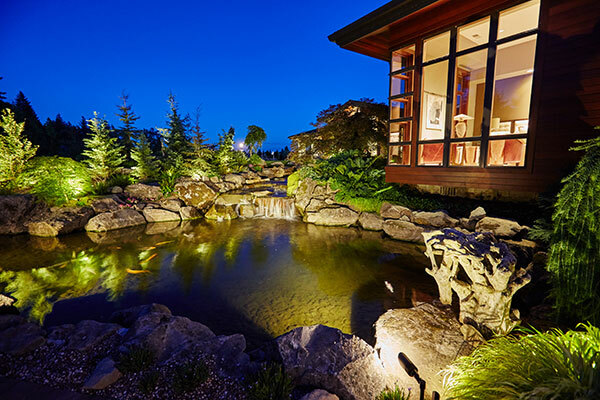 The west side of the courtyard koi pond and waterfall greets visitors as they approach the home’s front entry on a quartzite tile bridge. The koi pond abuts the window foundation. Special structural reinforcement and waterproofing was needed to support the load and avoid wicking water. An extensive outdoor covered patio fully opens to the inside of the home. 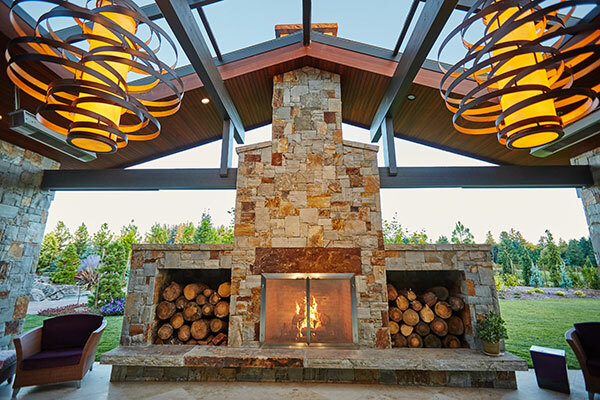 It’s heated with an in-floor heat system, infrared ceiling heaters and a large gas-lit wood-burning fireplace. The stream exits from underneath the pool bridge, concealing the transition from saltwater to fresh water that has taken place. 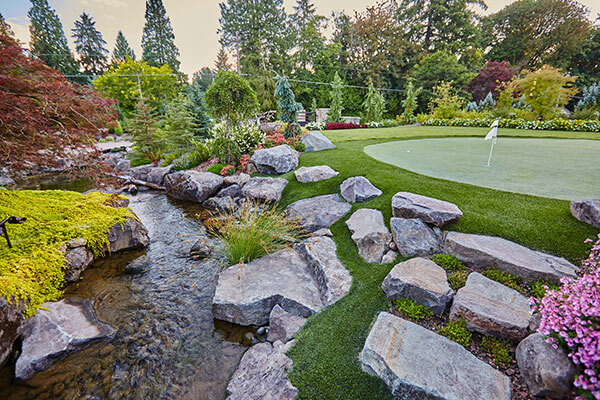 A 3,500-sq.-ft. putting green was designed to provide diverse putting terrain that includes an 80-ft. long putt opportunity. 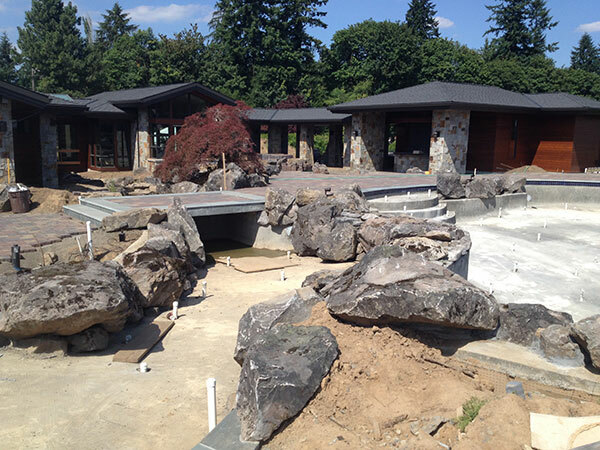 Extending the artificial turf throughout boulders provides realism. 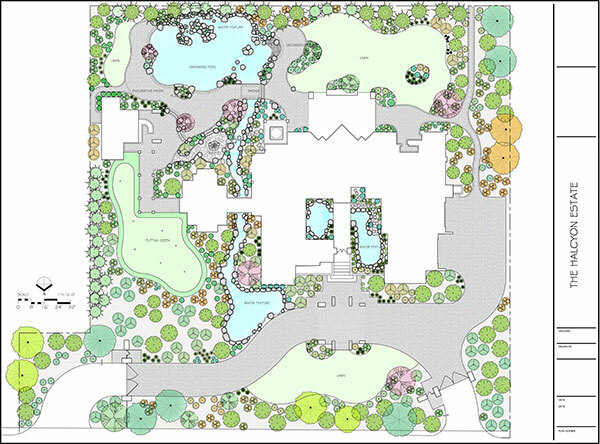 The landscape plant palette represents eight different climate planting zones, and more than 500 different plant and tree varieties, 2,300 annuals and 700 perennials. 1 Comment on "Big Picture: At home with nature"
Why salt water?…waste/runoff from nursery?